Agricultural and industrial machinery specialist Ashmore Engineering , introduce their Binmax and Bin Buddy grape trailer series. Specially designed to handle ‘Falland’ bins, the Binmax grape trailers can also be readily adapted to other types of bins. They have been primarily designed for use in the grape industry but can also be utilized to transport other horticultural products. The Binmax grape trailers can be connected to any tractor with a single set of hydraulic outlets, an unimpeded return line (case drain), and a set of electrical connections and are controlled entirely from the tractor seat with electronic solenoid valves. 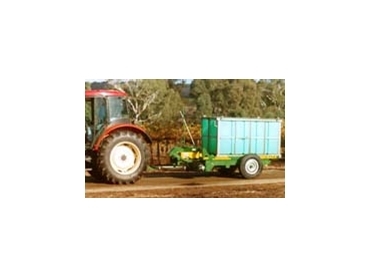 Exceptionally rugged, the Binmax grape trailers can hold approximately 3 tonne. The Bin Buddy grape trailers have been designed to work in conjuction with the Binmax grape trailers, though they may also be used independently. They are primarily used to directly transport bins from vineyard to winery.